I don’t deep fry things often – it’s not the sort of thing I’d like to get in the habit of doing regularly. But, just occasionally, when you can produce something as amazing as beer battered halloumi, vegetable tempura, or crispy battered mushrooms, it’s totally worth it. 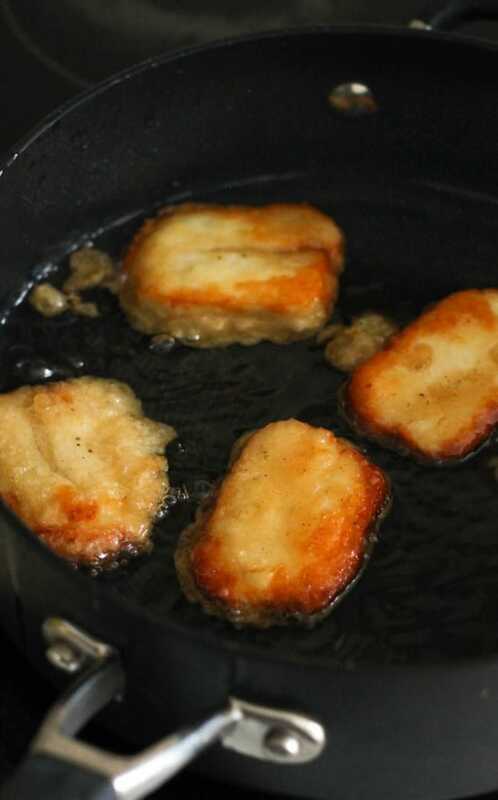 A lot of people are a bit afraid of deep frying at home without a dedicated fryer, but as long as you take a few precautions, it can be pretty easy. Here are my top tips for deep frying safely at home, without having to fork out for a fryer that you may well only use a few times a year. It’s no use trying to get stuck in with the frying if you’re not prepared – it’s not fun trying to fish a slotted spoon out of the drawer with hands covered in batter, or attempting to tear off a piece of kitchen roll with a piece of hot food balanced on a spoon. Be prepared, and have everything laid out neatly before you start, and you’ll be much less likely to make any dangerous errors. – A large, deep pan for frying. I tend to use a very deep frying pan (this one, which is pretty much my favourite pan ever), or sometimes a big, deep wok. – Oil! You don’t need to completely fill the pan – just an inch or two in the bottom is plenty. Make sure the pan is no more than a third full. If the oil level drops a little between batches, just top it up and allow it to heat up again before adding the next batch of food. – A slotted spoon or spatula, to lift the food from the oil. 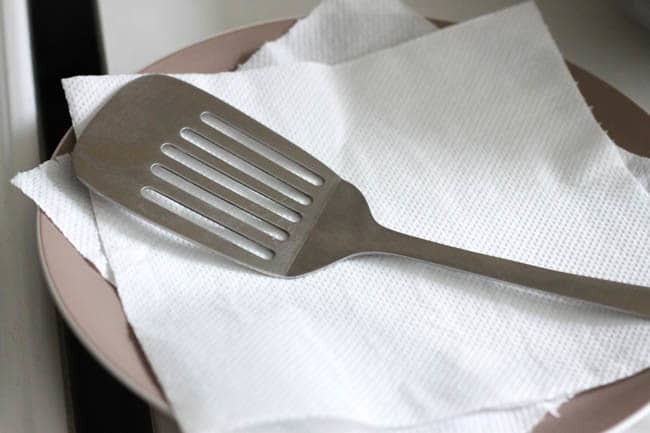 – A plate lined with a couple of sheets of kitchen paper, to drain any excess oil from the food once it’s been fried. Get everything ready and you’re good to go. Oil gets hot, and can be dangerous – but the more anxious and flinchy you are around it, the more likely you are to splash yourself. – When you drop your battered food into the oil, carefully lower it right down to the level of the oil before letting go, as this will avoid too much splashing. – Avoid flinching and pulling your hand back too quickly, or you’ll flick batter everywhere – just let go of the food and then bring your hand up in a controlled way. – Don’t wear long sleeves that can dangle and get in the way – but do wear an apron to protect your clothes from any spitting oil. – Don’t overheat the oil – you’ll probably only need your hob to be set to a medium heat. If the oil starts to smoke or spit madly, turn it down immediately. 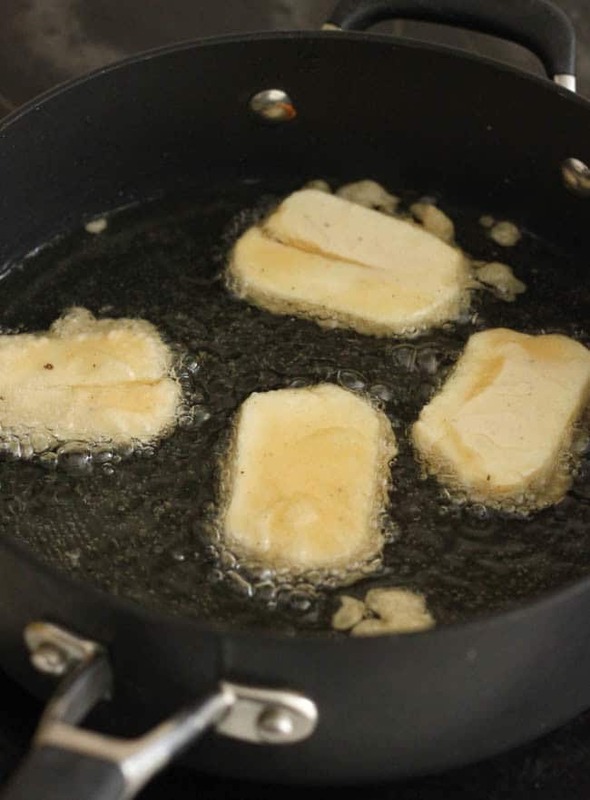 To check whether the oil is ready for frying, drip a tiny bit of batter into the oil, and if it bubbles and sizzles a little, it’s ready to use. – Never ever leave the pan unattended. – Mop up any drips of oil or batter as soon as they occur, as they’re a lot harder to clear up later. Batter in particular is a pain to clean up once it’s dried onto your worktop! 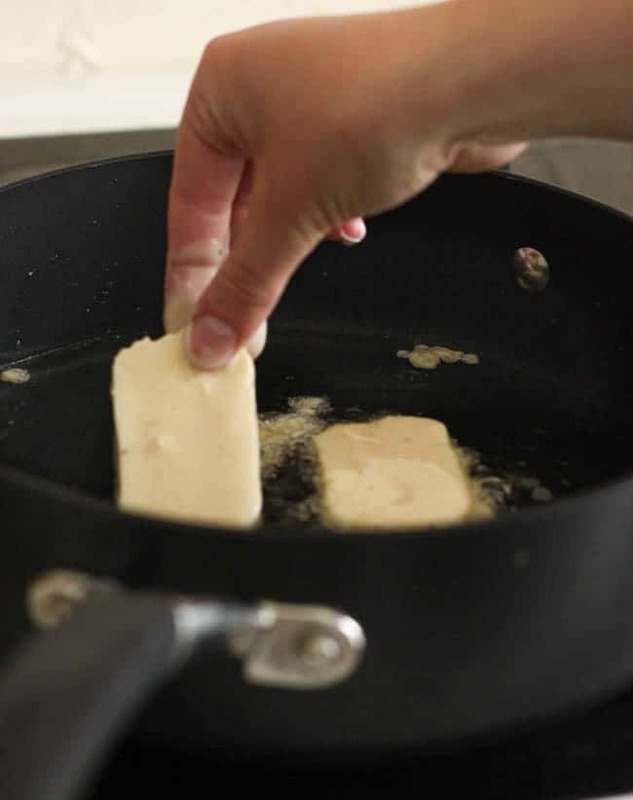 – Use the slotted spoon to remove any loose bits of batter from the pan. They end up burning and making a mess, so just clean them out of the oil between batches. – Don’t let the slotted spoon sit in the pan, or you could end up knocking it and splashing the oil. Return it to a plate or dish when it’s not being used. – Don’t overcrowd the oil – cook in batches, and make sure each batch of food has plenty of space in the pan. When you’ve finished cooking, it’s time to think about the clean-up (grumble grumble). – Do not try to pick up the pan while it still contains hot oil. It’ll be heavy, and it won’t end well. Just turn off the hob, let the oil cool down at its own pace, and don’t touch it again until it’s completely cooled. – Dispose of your oil responsibly! Oil doesn’t solidify in the same way that animal fat does, but it can still make a mess of your pipes (and the pipes in the rest of your town!) if you put too much of it down the sink. 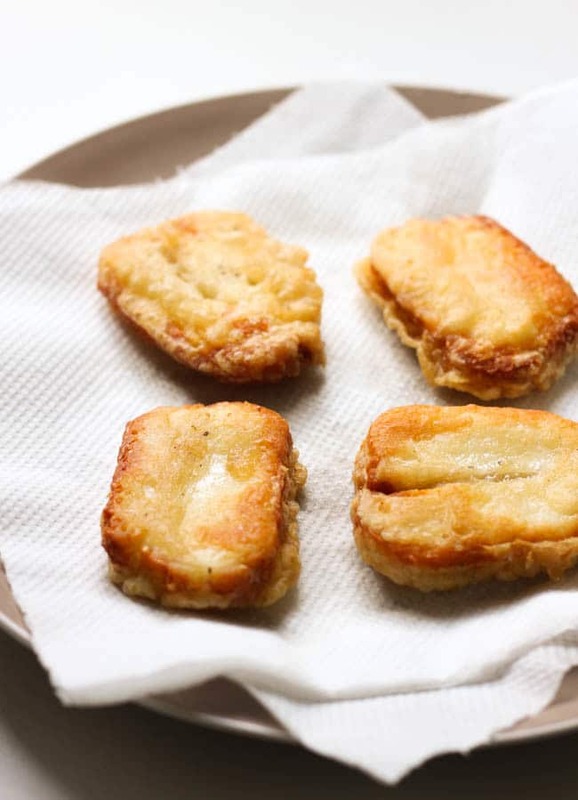 If you sieve the oil thoroughly to remove any little bits of batter, you can keep it to reuse it later. Or, if you’re determined to get rid of it, seal it tightly in a bottle and throw it in the bin. – If, heaven forbid, you do manage to start a fire (don’t be scared! This has never happened to me and hopefully won’t happen to you either), remember that you should never pour water onto it! Just turn the hob off (if it is safe to do so), call the fire brigade, and leave the house, closing the kitchen door behind you. … and here’s hoping I haven’t scared you off frying for life. As long as you’re well prepared and take a few easy precautions, all should go well. I was afraid of frying for a long time, but I’ve done it several times now and it really isn’t as scary as it first seems! Oh, and if you’re making beer batter, save the rest of the can for later… drinking and hot oil aren’t a great combination. What do you think, have I managed to convince you that deep frying at home can safely be done, even without a dedicated fryer? 100% agree that preparation is key. Same with cooking any last-minute things. Thanks for all your tips! The key for me is to add enough oil to the pan. Great tips. Deep frying does make me nervous so good to have some pointers. I do love deep frying and it is good to be reminded of how to do it safely as it is easy to get relaxed about it. Great tips Becca. I just avoid deep frying because I just never know what to do with the oil afterwards as I don’t really want to use it again, keep it nor throw it away! It’s a dilemma LOL! In all thiks talk about living a healthy lifestyle – wee cannot overlook simply choosing to ENJOY LIFE! Wow, great to show that this can be done at home. Though I think my nutrition teachers would be turning at their grave at this one so best reserved for well deserved treats I think! Good post! 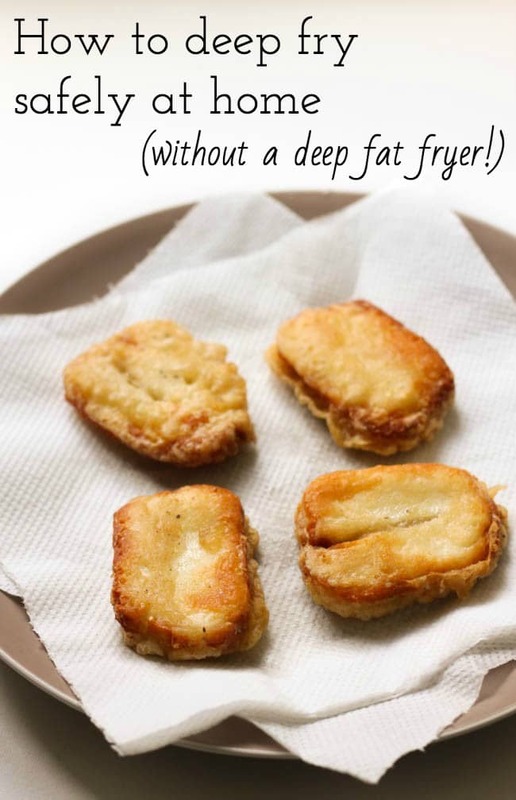 Count me among those who were afraid of deep-frying until I just decided to do it! I use my Le Creuset saucepan and it works perfectly. The cast-iron seems to heat the oil more slowly and keep the temperature more consistent throughout the cooking time. In Japan, the oil goes into our burnable trash. We put it into a used juice carton; have to be careful about it not spilling, but that way everything is disposed of properly. Thanks for sharing these tips! I’ve always been intimidated by deep frying but there are so many delicious things that I’d love to try making (funnel cakes for one) so I appreciate you taking the guesswork out of it! This is really great Becca! So informative without being boring :) Love it! Husband does this regularly with poppadoms in a deep pan similar to yours. If your oil catches fire, you can put it out by covering the pan with a (metal) lid and leaving the lid on. So if you have one of a proper size to completely cover the pan, keep it handy just in case. It strangles the fire by depriving it of oxygen. I’m not sure if you can do this with a pyrex lid or if the pyrex would shatter from the intense heat (note to self, ask fireman-uncle about this). We also have a fire blanket on the kitchen wall near the hob for the same reason. Those don’t cost very much.